OnePlus offered a nice Christmas gift to OnePlus 5 owners last year, but little did we know that the OxygenOS 5.0 based on Android Oreo would be pulled only days later. The culprit? A bug that would cause issues with third-party camera application. Apparently, issues with some European carriers have been blamed for halting the roll-out of the update as well. 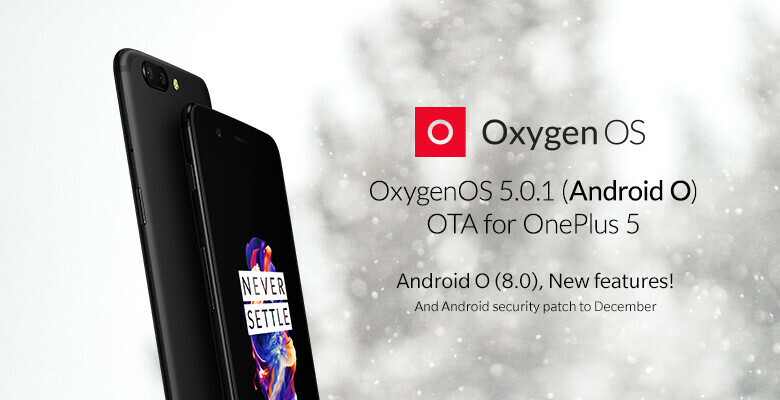 A few days ago, OnePlus announced that it's already working on OxygenOS 5.0.1, which is supposed to contain fixes for the bugs mentioned earlier. Today, OnePlus confirmed it has issued a small fix for those who already updated to the original build, which fixes problems with the third-party camera application and all the network issues with European carriers. If you haven't yet updated to Android 8.0 Oreo, your OnePlus 5 should soon receive OxygenOS 5.0.1, which contains all the changes of the first build and the necessary fixes. According to OnePlus, this is an incremental roll-out, so it will take a few days to reach to all OnePlus 5 devices.